The Lake Merritt Hotel was built in 1927. Originally called the Madison-Lake Apartments, it offered apartment-style hotel living in Oakland along the shores of Lake Merritt. The original owners were David and Edith Hadden, a prominent doctor practicing nearby on what was referred to as “Pill Hill.” The architect was the well-respected William Weeks, who also designed other famous buildings in Oakland and the greater Bay Area. In 1934, luxurious hotel dining was added to The Lake Merritt Hotel. Known as the Cascade Terrace in the early days, the restaurant and night club came to prominence when what was once an outdoor terrace was enclosed. Diners comfortably enjoyed overlooking Lake Merritt with a spectacular view. The Terrace Room soon became the city’s “hot night spot,” complete with an in-house band. Attracting big name stars and dance orchestras, Oakland music fans could listen to a live radio program that was broadcast each evening from The Cascade Terrace by the Tribune radio station, KLX. The restaurant’s beautiful dining room also hosted innumerable weddings, post-WWII dances and the Lake Merritt Breakfast Club’s first meetings. Acclaimed artist, Andre Boratko, painted a stunning interior mural depicting scenes of Lake Merritt in 1956. The original art work added elegance to the setting and can be viewed today in The Terrace Room Bar on the restaurant’s south wall. him to Randall Berger, owner of The Lake Merritt Hotel since 1987. So long as with a deadline of just one hour, a truck could be found with enough room to transport this painting, it made its way to The Lake Merritt Hotel. Rumor has it that this exact painting hung in the Terrace Room for decades before it wound up in that warehouse! 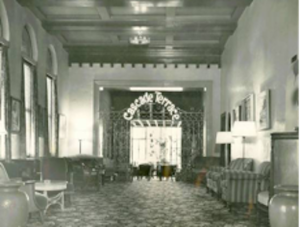 In 1928, Mayor John Davie proclaimed The Lake Merritt Hotel to be “a credit to the city,” while the Oakland Tribune stated that it was “Oakland’s most exclusive apartment hotel.” Rooms at that time were $3.50 per night (even more expensive than the Claremont Resort Hotel)! 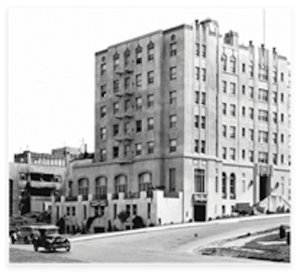 Over the years, hard work has been done to be true to the original design of the hotel. This was duly noted in 1992, when the City of Oakland declared The Lake Merritt Hotel to be a Historic Landmark. Along with dining, the Terrace Room is also available for weddings, receptions, parties and any other gathering you might be hosting.